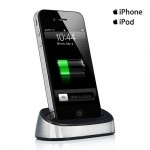 Corplex for iPhone iPod Dock - Green, Gadget Stop - For all of your phone and Apple needs! Corplex for iPhone iPod dock series cast dazzle to the scene. For people who have "color complex", it is a "love at first sight" encounter. Each color of Corplex is incredible and stunning. The elegant curve of the dock artistically adorns the design. A high quality rubber layer is attached to the bottom to avoid slipping. 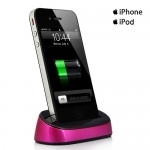 Charge and sync with the portable Corplex for iPhone iPod Dock - Add more color to your life. Corplex for iPhone iPod Dock series provide 7 different stunning colors: Black, Red, Blue, Orange, Green, Silver and Roseo. High quality, lightweight and portable. A rubber layer on the bottom to prevent slipping. 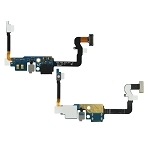 Charge and sync using this Corplex for iPhone iPod dock.